Are you looking for a Domestic violence attorney in Northern NJ? 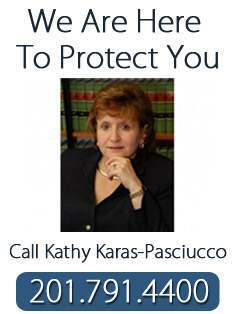 Kathy Karas-Pasciucco of Feitlin, Youngman, Karas & Gerson has been a Domestic violence attorney in Northern NJ for many years. Are you a victim of domestic violence? If you have been physically abused by your spouse or partner, it is crucial that you immediately contact the police or appear at the county court house to obtain a temporary restraining order. You will immediately be brought before a Judge who will decide whether to issue a restraining order. Once a temporary restraining is served on your spouse or partner, he/she will be ordered to stay out of your home until the matter is heard before the court. If you are stuck in the cycle of violence it may be difficult for you to know how to proceed or if you should proceed. You may be afraid for yourself and your children and have many questions. At FYKG we handle domestic violence matters with compassion and understanding. If you believe you have been the victim of domestic violence and have questions, contact our experienced attorneys. Have you been served with a temporary restraining order? Unfortunately, claims of domestic violence sometimes are used by a spouse or partner to gain a strategic advantage over the other person. If you have been served with a temporary restraining order you must appear in court before a final decision is made. It is crucial that you do not attempt to contact your accuser or to have someone else contact your accuser on your behalf. It is also important to appear in court with a lawyer in order to protect your rights. If you are looking for a lawyer or have questions concerning a temporary restraining order, contact one of our experienced lawyers who will assist you through this difficult process. If you considering separation or divorce, we suggest that you reach out to us to see if we can help you through these troubled times.